Want to make better beer? Being a great homebrewer is about more than just knowing good recipes. If you want to be the best, having an understanding of the basic chemistry involved in making beer will give you added insights that can help both avoid potential issues as well as get the most out of your brews. 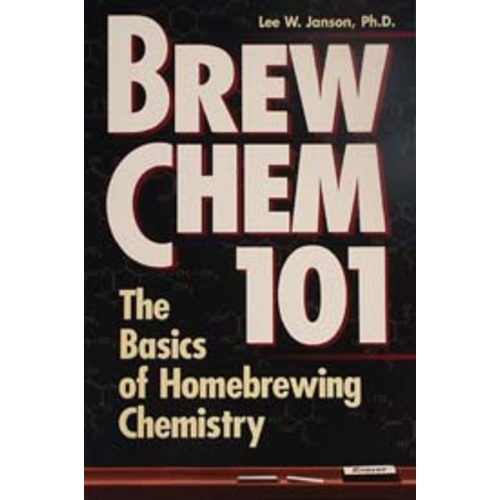 Brew Chem 101: The Basics of Homebrewing Chemistry, by Lee Janson, is an easy to read book about the basic chemistry of brewing. It uses non-technical language to explain the chemical reactions at each stage of the brewing process. Having this understanding will give you insight into each stage of the beer making process so that you can trouble shoot if problems arise, or avoid them completely! This is a short little book that's a fun read to help you better understand the science behind much of brewing. $15 is over priced, and I'm not sure I'd pay that. I got it as a gift and it's definitely worth free, or a bit more if it's ever on sale. Otherwise you can get other books with a lot more useful information for that price. Goes lightly into many technical subjects. If you don't have a Chemistry background this book does a nice job conveying some of the concepts used in brewing. It even has pictures of molecules so you can visualize what an enzyme does. It might not help your brewing much, but it will help your understanding of whats happening and why. A good book. Reads well on a technical subject. Only 100 pages but all are focused on the chemistry of beer. This book is on my reference shelf...will not be sold as other brewing books have been.